Most people falsely believe that cats are fully capable of grooming themselves all the time without any help from their owners. This is simply not the case. Truthfully, your cat needs you to help them out with their hygiene just as much as your dog does. While they might seem finicky and like they don’t really want to accept your help, they will always feel better once the process is done. So what do you do about the grooming of your cat? Why is it important? What do you need to get the job done? Thankfully, Pro Pet has a great line of cat grooming supplies in their inventory. Below, we will outline some of our favorites, how they work, and why they are necessary. 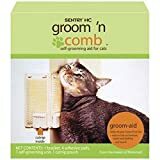 What is Needed to Groom a Cat? Now You Can Keep Your Cat Looking Sleek and Feeling Happy! Grooming a cat is not rocket science. You do, however, want to make sure that you are taking every precaution to groom your cat in a way that they will enjoy so that they will not be fearful of future grooming experiences. The first step is to spend a few minutes with your cat, petting them and talking to them to let them know that you are about to groom them. Cats do better when they have a little warning. Next, you will gently clip the cat’s claws. Be careful that you do not hurt your cat in this process. Always comb your cat before you try to brush or bathe. This will eliminate any loose hair or matting that could create troubles in the rest of the process. If necessary, you will do any trimming you need to do at this time, as well. When you bathe your cat, you want to make sure the process is slow and gentle for them. Cats are naturally fearful of water, but if you introduce them to the bathing process gently, they are more likely to accept it without a fight. After bathing, but before drying, you will clean the cat’s ears with specially formulated ear cleanse. You can purchase this at most pet stores. Comb your cat’s hair, then gently blow dry them on the lowest setting. Throughout the process, make sure you are giving your cat plenty of praise and attention. When finished, reward them with their favorite treat. Cats are known for being pampered parts of our lives. Their grooming routines are no different. It shouldn’t surprise you that they require a great deal of supplies and tools to be effectively pampered and groomed. A cat needs everything from nail clippers and de-slickers to look and feel their very best. There can be an overwhelming variety of tools on the market and some of them are not designed correctly. When narrowing down your search for cat grooming tools, you need to consider your cat’s coat type, length, and individual needs. You also need to make sure that you are buying quality products from a trusted manufacturer or source. Your kitten will be so fresh and so clean after getting a bath with this mild kitty shampoo. Cruelty free, Sulfate Free, No Colorants, pH balanced for dogs. Made with the highest quality all natural ingredients: buttermilk powder, honey, and beeswax. Cats hate water. We all know this. They do still need to be shampooed from time to time, though. A waterless shampoo can help get that job done in a hurry. Occasionally, though, they will need to be washed the good old-fashioned way. You can make the experience slightly less troubling for them by using a tearless formula of shampoo. Cats have sensitive eyes, so even the slightest irritation can be traumatic. Take care of their eyes as you’re cleaning their coat. NO SCRATCHING & ENJOYABLE With premium silicone material, the Celemoon cat grooming brush is ultra-soft, safe, comfortable and durable. It will never scratch your pet's skin and they will love how it feels and enjoy grooming! EFFICIENT SHEDDING Remove up to 90% of shedding hair from your cat within minutes. Simply comb gently over your cats coat, within seconds you will have a fistful of fur. And after 5 minutes you will be amazed at just how much loose hair has been removed. 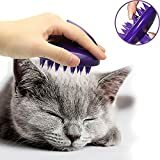 WASHABLE & EASY CLEANING Not like other brush, you could even rinse it thoroughly with water to remove all the hair from the brush simply when you're done brushing your cat. And then it will get ready for the next time use. NONE-SLIP HAND GRIP The hand grip would perfectly fit into your hands and fingers and avoids slipping when using. This compact cat brush is very comfortable to hold and use! BUYERS GUIDELINES BEFORE BUYING Adding some water on the surface of the brush could help attract more hair. Kittens and cats are constantly grooming themselves. That doesn’t mean that they are getting all the snarls and tangles out of their fur, though. You do need to make sure you are brushing your cat or kitten regularly. They require regular grooming from you even though they are constantly self-grooming, too. Certain brushes are more useful than others. If your cat sheds a lot, they will need to be brushed regularly with a de-shedding tool, for example. Other cats with thicker fur might need a slicker brush to help their hair stay coiffed. RECOMMENDED BY PROFESSIONALS- The Boshel pet nail clipper is an ergonomically designed Powerful and easy-to-use pet trimmer for small dogs and cat nail trimmer. 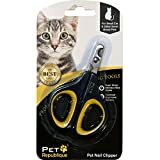 This pet clippers for cats is recommended by animal trainers, veterinarians, pet grooming professionals and by our large base of satisfied customers as the best cat nail clippers to use for cats and small dogs. SAVE TIME AND MONEY- Our professional nail clippers for cats is super easy to use which will allow you to take care of your pet right at home. No more spending precise time and money at the vet. Whenever your little one is in need of a mani-pedi groom, use this small claw scissors and trim your little one's claws, nails, safely and professionally. CLEAN & PRECISION CUTS- The pet trimmers for small dogs and cats is ergonomically designed with a razor-sharp stainless steel SEMI-CIRCULAR ANGLED BLADE. You'll be able to see what you're doing and help you determine how much you need to cut without going near the sensitive spots and avoid a bloody mess even without a quick sensor. COMFORTABLE, SAFE & EASY- The Boshel nail trimmer for small dogs and kittens features comfortable, easy grip, non-slip, ergonomic rubberized handles which stay safely in place in your hands to ensure ease of use and prevent accidental nicks and cuts. It will keep you calm even if your pet won't be thrilled while getting their nails clipped. IT WORKS FOR YOUR PET OR IT'S FREE- This Boshel professional pet nail trimmers are perfect and safe to use as Kittens, Cat nail clippers, Small dog nail clippers, Rabbit, Guinea pigs, Hamsters, Birds nail trimmers, And for most other small animals. If it does not work right for your pet, or if you are not 100% satisfied, you are always covered under the Boshel hassle-free warranty. In recent years, the practice of declawing cats has gone to the wayside. It’s been determined that cats actually suffer greater pain than we originally expected when they have this seemingly simple procedure done. Because cats are no longer being declawed as often, the need to clip their nails has become somewhat of a necessity. You will need to find a clipper that works with your cat’s claws, which are susceptible to splintering and being cut too short. One painful nail clipping experience can create lifelong problems for your cat, so it’s important you start off with the right tools. SUPERIOR DEMATTING BRUSH - THICK UNDERCOAT? SENSITIVE skin safe 2 sided de-matting tool glides thru even the THICKEST 2 LAYER COATS - GENTLY detangling mats, knots, burrs and matted fur. 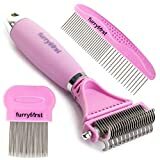 95% LESS SHEDDING w/ DESHEDDING RAKE - NO SCRATCH de-shedding comb with stainless steel medium course teeth gently removes dead undercoat - reduces frustrating hair on floors, couches, and clothing. EASILY AND EFFECTIVELY BRUSH OUT UN-WELCOMED GUESTS from your furry friend's coat using this mini fine tooth comb with small rounded metal pins. LUSH COAT, RIGHT AT HOME - 10,000+ PETS APPROVED: hair length & size doesn't matter. Reviews show that small maltese puppy, medium lab retriever, German Shepherd, ragdoll cat, EVEN Persian kittens LOVE feeling pampered with this set. LIFETIME HAPPINESS GUARANTEE - experience 100% satisfaction with how our grooming set saves time dematting, grooming & cleaning up furry messes FOR LIFE or we'll refund you 100%! A daily de-shedder is any tool that can be used once daily to clean your cat’s fur. Usually, it’s a mitt that is specially designed to remove loose fur from the cat as you pet it. As you build your cat’s grooming routine, you will need to make sure that you have the correct tools on hand. Pro Pet Supply has a variety of tools that can help you build up a grooming toolkit. Below are some of the best tools for cat grooming that Pro Pet Supply has to offer. Each is uniquely formulated and designed to provide easy, adequate care for your cat. Magic Coat Waterless Shampoo is a wonderful dry shampoo that makes bathing your cat a breeze. It leaves your cat looking clean and smelling great without putting them through the unsavory task of being drenched in water in the bathtub. This is a good regular shampoo for your cat. You can use it from time to time to keep your cat looking and smelling clean as well as feeling its best. Of course, you will still need to give your cat a “real” bath once in a while, but between those occasions, you can keep everyone happy with this shampoo. The Magic Coat Tender Tip Deluxe Love Glove is a mitt that serves as a great daily de-shedder. It’s simple to use and your cat will actually enjoy it. You simply place the mitt on your hand and pet the cat as if you were greeting them coming home from a long day of work. As you pet the cat, the fabric of the mitt is designed to catch and collect loose hair. After the daily de-shedding is done, the hair can simply be peeled off as if it were lint in a dryer lint filter. Tender Touch Slicker Wire Brush for Cats & Kittens is a wire brush that slicks the hair down and smooths it. This brush should be used a few times a week with gentle pressure. The hair will lay flatter and be free of snarls when finished, but the wires can be painful if you push too hard. Take care to treat your kitty with the respect it deserves during the process. This self-grooming aid is a cute little mechanism that sits in the corner for your cat to rub against. When they do, they are able to groom themselves better. This makes for a better experience for them and an easier time for you when the real grooming begins. Cats naturally want to groom themselves, but sometimes they aren’t very good at it. The Kitty Korner Komber helps them do their best job possible. PROFESSIONAL PAW NAIL CLIPPERS! -One of the best cat nail clippers / professional small animal nail clippers on the market. These nail clippers are designed for small breeds: kittens, cats, rabbits, puppy, chinchilla, guinea pig, and more. TOP QUALITY! - 90 Days money back guarantee, and 4 years warranty! Our thick stainless steel blades is strong and sharp to last for years. These nail clippers are quality controlled during the process of manufacturing. Parts will not loose or fall apart, making this a top quality professional cat nail clippers on the market. TIPS! - Apply baby oil to make the quick of the pet's nail visible. If pet's nails are very long, cut off a small amount and wait a week before cutting again. Clear instructions are printed at the back of the nail clippers package. HELP SAVE OTHER ANIMALS! - When you buy any product from the Pet Republique (Seller), we will donate 15% of the profits to the American Animal Rescue Society, where rescued abandoned dogs and cats are homed and loved. So make sure you are purchasing from the Pet Republique (Seller) before pressing the buy box to support our donation and receive the described product. 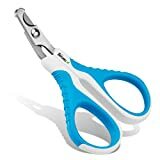 These nail-trimming scissors are gentle enough and sharp enough to get the job done quickly and easily. You can trim your cat’s nails effortlessly and also protect them from the splintering that can be sometimes painful and even cause permanent damage to your cat. The best bonus to an easy and effective nail trim is that future nail trims will be easier to manage. When a cat learns to trust the process of the nail trimming, they will not fight you. This will make trims easier and easier as time goes on. Grooming your cat is as important as grooming your dog. Making your cat’s hygiene a part of your daily routine is important and having the right tools on hand to accomplish this task is crucial. A poor cat grooming experience can not only be physically harmful to your cat, but can create problems in the future when it comes time to groom your cat again. Don’t let a poor grooming experience today create problems for the cat’s grooming throughout the future. There are a number of great cat grooming products available from the Pro Pet lines. They are all specially designed to provide the best possible grooming experience for your cat, as well as convenience for you. Cat grooming is not rocket science, however you will want to make sure you are doing your best to produce a happy and relaxing time for your cat during the process. Soon, you’ll be breezing through the process in no time flat. Previous articleTop 12 Best Pro Pet Supplies Dog Carrier Options!